Chances are, when you were in college, you were involved in volunteer efforts in one way or another. During that time, you learned how rewarding it is to give back to your community, first hand. The feeling of being part of an organization that helps veterans and military families, feeds the hungry, cleans up and cares for the environment or cares for seniors can be a very fulfilling experience. You positively impacted your community, made new friends and gained a sense of purpose with the time you spent volunteering. However, after you graduated, got a full time job, got married and had kids, the hours in the day now rush past in a blur. Even though you would love to still have the time to dedicate to volunteerism, life’s other demands tend to take precedence. Fortunately, here at ABG Capital, our leadership recognizes the time constraints of our busy lives and builds time to volunteer into our work/life balance by organizing opportunities to give back during the work day. Our latest volunteer event took place last week at the Greater Washington County Food Bank who has been providing groceries and nutritional information and education to food-insecure residents of Washington County for over 33 years! 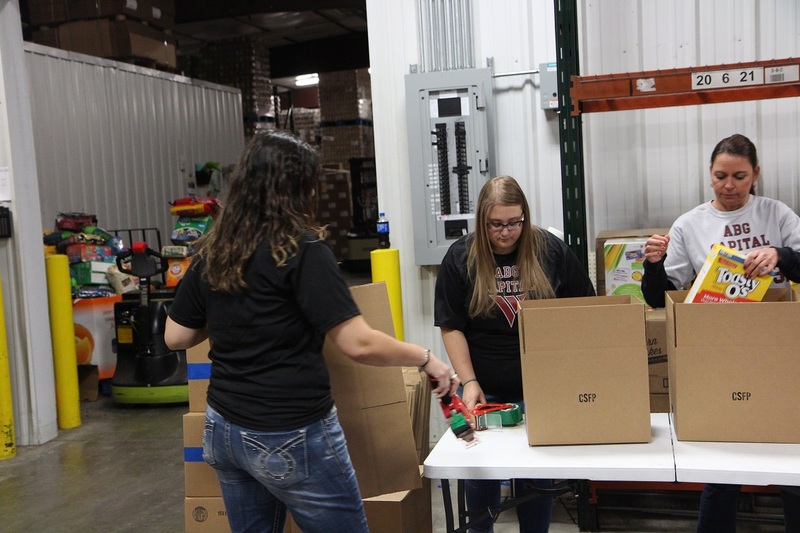 Recently, they’ve moved to a new facility which they hope will maximize their efforts to end hunger and with the anticipated opening of an on-site thrift store, allow them to provide gently used clothing and household items to the community. Last Friday, we joined them to pack Senior Boxes which go out for delivery to area seniors in need. We packed over 500 boxes of food and had a really fun time working as a team and getting to know the folks who make the GWCFB run! Here are a few pictures of our event! If you would like to contact the Greater Washington County Food Bank and offer your volunteer services, you can check out their Get Involved page on their website. Also, not only do we take part in giving back through initiatives like these, we also give back through the Tapolci Foundation. Giving feels good! This entry was posted in small business by Natalie DeCario. Bookmark the permalink.